Unilever has officially announced the sale of its spreads division to US-based private equity investors KKR for EUR 6.825 billion, some 8 billion US dollars. The sale can only be finalized when it clears regulatory procedures, but there should be no competition issues: KKR is a private equity fund, not a food company, and its current portfolio includes no spreads manufacture (a full list of KKR-owned companies, past and present, is available here). Unilever spreads have been under fire from financial analysts for years. Not because the business isn't profitable - spreads account for a greater share of profits relative to sales than other Unilever products - but because sales are not growing fast enough to suit overheated financial expectations, and Unilever was not inclined to invest substantially in the future of the business. 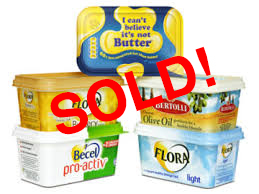 Unilever's spreads division appealed to KKR because of its huge cash flow. While KKR is now a financial conglomerate with a variety of activities, at its core it remains a leveraged buyout fund, and their buyout business works on a decades-old model pioneered in the United States and then exported globally. The buyout fund borrows heavily ("leverage") to purchase a company or its shares, using the company's assets and projected future revenue as collateral to fund the debt. The acquired company pays for its own acquisition because the debt goes on its own books. Money earned from sales gets paid out as interest on the loans, frequently at high interest rates ("junk bonds"). Cash flow comes under additional pressure as the fund charges millions in 'administrative' and management fees. Further debt can be taken on to finance special payouts to the new owners. The buyout fund holds on to the company for a limited period, then sells it on and captures 20 percent of the profits. When the deals go well, buyout funds reap substantial profits because they minimize their own equity stake in the transaction, generating the oversize "return on equity" dear to financial markets. KKR, the famous "Barbarians at the Gate", invested less than USD 2 billion of its own equity in the USD 25 billion buyout of RJR-Nabisco, 87% of which was financed through borrowing. That deal was an industrial and financial disaster which destroyed tens of thousands of union jobs in the US alone. A fierce bidding war drove up the share price KKR ultimately paid and the high interest bonds which financed the deal turned out to be junk. But KKR came out of it ok, having invested so little of their own money, and was eventually able to sell on the badly fractured business. KKR's 115 portfolio companies today employ 720,000 people, making them the third largest US private sector employer after Walmart (number two is another private equity fund, Apollo, who finally dropped out of the race to buy Unilever's spreads). The ownership structure, when the deal is official, will probably be an investment subsidiary parked in a tax haven, somewhere offshore or perhaps in Luxembourg. In the Unilever press release announcing the sale, Nicolas Liabeuf, the Unilever spreads CEO who will move (for how long?) to the new company, says "There is a positive momentum in the performance of the Spreads business and we are excited about continuing this journey with KKR. We are confident that our business and the entrepreneurial spirit of our people will thrive further under new ownership." As the financial blog Seeking Alpha commented immediately following the sale, however, this may be an improbable scenario: "Rigorous cost-cutting and being milked for cash seem like the business's most probable future." In other words, what workers in the spreads division have been already experiencing for years. And with the sale of the spreads cash cow, Unilever will have to press its workforce harder to generate the expanded returns it has promised investors in the wake of the failed Kraft Heinz/3G bid. Will private equity ownership mark a significant change? Much depends on how the deal is financed, and we won't know that until KKR does its first regulatory filings with the US Securities and Exchange Commission. In any event, workers will have to be organized to resist current and future management pressure. The IUF brochure Private Equity and Collective Bargaining explains what financial information unions need to help bargain effectively with private-equity-owned portfolio companies.